Oblong printed stamp with: "In Honor of Igor Stravinsky's 80th Birthday". "(DL 5504)" bellow cat# "BRG 72055". Blue label with CBS logo around the spinge hole. On top right corner, bellow cat# "BRG 72055": "(DL 5504)". Credited liner notes ("Apropos Petroushka" and "Igor Stravinsky is eighty" (signed by the President of Columbia Records Inc., U.S.A.)) in English (only). Tracklisting composed from the center-label and liner notes info. No durations shown on this release. 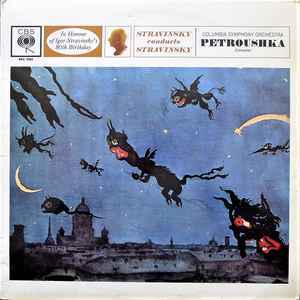 Note the discrepancy between spellings: "Petroushka" on covers, "Petrushka" on center-labels.